At Denison University in Ohio, Steve Carell started a touring comedy company with some friends. After graduating in 1984, he moved to Chicago and started taking improv classes and working in theatre, and eventually he joined Chicago's Second City troupe. By 1989, he had worked his way onto Second City's Mainstage. He met his wife, fellow Daily Show senior correspondent Nancy Walls, when she took an improv class he taught at Second City. Carell's first film was John Hughes' Curly Sue, in 1991. He wrote and performed for The Dana Carvey Show, which lasted two months in 1996. He was also on ABC's brief Tim Curry-Annie Potts comedy Over the Top. On Saturday Night Live's "TV Funhouse", Carell provided the voice of Gary, the sidekick in the recurring "Ambiguously Gay Duo" cartoons, working under superhero Ace, voiced by Stephen Colbert. 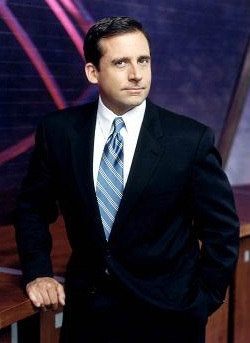 As a senior correspondent on The Daily Show, Carell's recurring segments included "Slimming Down with Steve", "Ad Nauseam" (critiquing commercials), "Produce Pete", and "Even Stev/phen" (where he argued with Colbert). From 2005 to 2011, Carell starred in an Americanized version of BBC's The Office, "inspired by" instead of "based on" the original, with Carell as the incompetent boss first performed by Ricky Gervais. The TV show's success allowed Carell to move into film acting as well, with hits including The 40 Year Old Virgin and Little Miss Sunshine.